We Millennials seem to be busy folk with little time available to slouch in front of the TV, but let's be honest, after a long week at work few things are better than winding down with a good movie. It's a favourite pastime for many, but to do it properly you need a few things - a quality TV or projector, a decent surround system and a large tub of popcorn. Some of those criteria are easy to meet, but surround sound can be a stumbling block - after all, who wants wires draping around their living room? If only there was a speaker system that was stylish, powerful and able to serve 5.1 surround sound as and when needed. Turns out there is and it's called the Philips Fidelio E6. 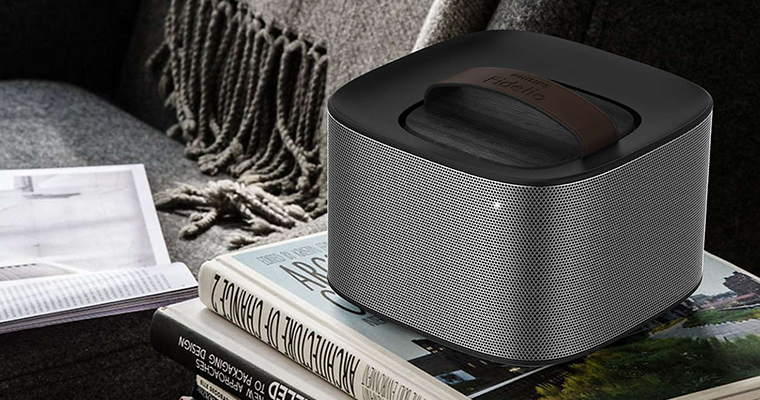 Priced at £800 and aimed squarely at users seeking a surround experience with minimal fuss, the Fidelio E6 is a sleek-looking solution that has the ability to transform from 2.1 to 5.1 in a matter of seconds. 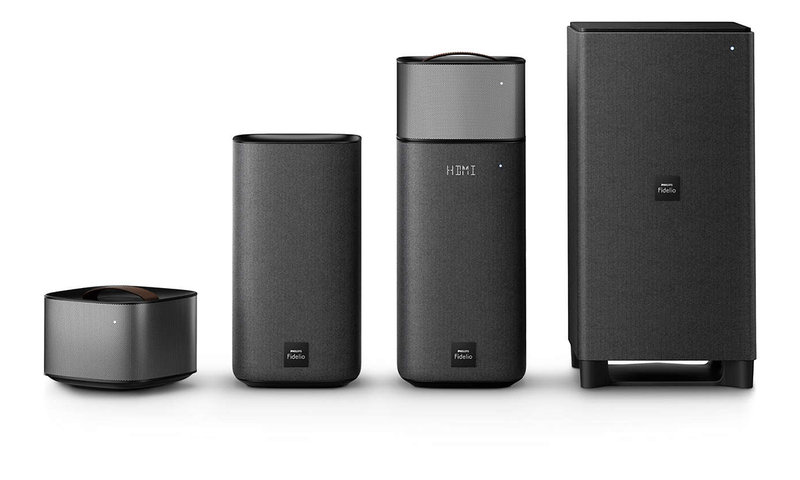 In its standard form, the system comprises two stereo speakers and a subwoofer. Come movie night, detach the wireless rear speakers from the tops of the main units and place them in your preferred position for a true multi-channel experience. Sounds alarmingly simple and too good to be true, but Philips has almost pulled it off. 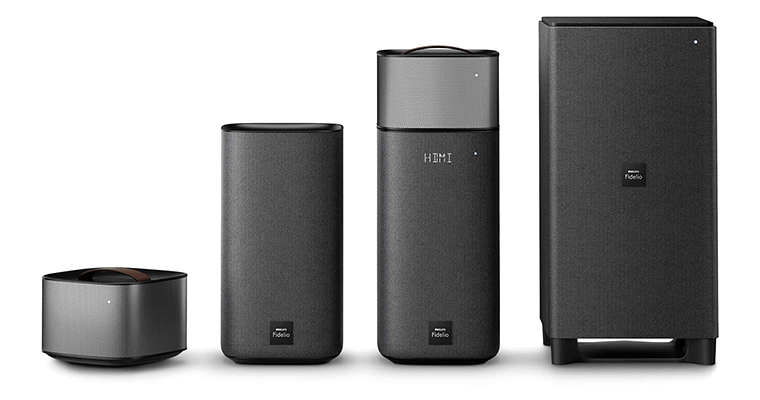 The main speakers, measuring 30cm tall and 16cm deep, are wrapped in a trendy grey fabric and finished with rounded edges to help them blend into the environment. 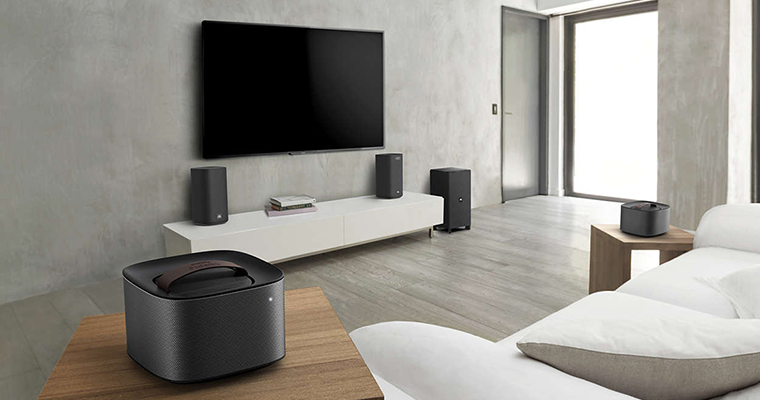 Height increases to 40cm with the rear speakers attached, while the subwoofer measures 45cm x 22cm x 22cm and connects to the main units using the same proprietary wireless frequency as the battery-powered rears. Faux wood panelling lines the tops of the subwoofer and rear speakers, and the latter also feature leather carry handles adorned with the Philips Fidelio logo. It's an elegant piece of kit, but don't be fooled into thinking that wires have completely been eliminated. You will need to run a power cable to the subwoofer, a second power cable to the left speaker, as well as a long, thick DIN cable that runs from the left speaker to the right. There is inevitably some wiring to contend with and the number of cables will grow depending on which equipment you decide to attach. Providing plenty of choice, the rear of the right speaker is home to two HDMI 1.4 inputs, HDMI ARC out, digital, coaxial and 3.5mm audio inputs, Ethernet and a USB port for manual software updates. A decent selection, though given the price point it's a shame Philips hasn't opted for the newer HDMI 2.0 standard, so while you do get Dolby Digital and Pro Logic II, there's no support for modern audio technologies such as Dolby Atmos. Guiding the user through setup is an LED display tucked behind the cloth of the right speaker. Arguably one of the Fidelio E6's weakest design elements, the display offers limited data and isn't always easy to follow. It can be turned off by selecting the lowest dimming mode, but the status LEDs dotted around the various components remain illuminated at all times - these are used to provide at-a-glance details such as battery life, charging and on/off. Fidelio E6 is best enjoyed as a speaker system for movies or games. In a 2.1 configuration it represents a significant upgrade over the built-in speakers available to most flat-screen TVs and switching to 5.1 further elevates the experience. Converting to surround sound is practically seamless - simply place the speakers around the room - and, with the rear units in your preferred position, a built-in spatial calibration function plays tonal sounds to optimise the audio for your environment. Ease of use is at the heart of the Fidelio solution and charging couldn't be simpler. Philips doesn't specify battery life but we've had the rear speakers running for five hours without interruption, and when the battery is running low, dock the units back on top of the main speaker to refuel. Continuing the user-friendly approach, Philips' small remote control provides quick access to all the core functions. Volume controls are partnered with independent bass and treble adjustments, there are one-click buttons for music and movie modes, and a night mode is at hand to reduce the amount of bass coming from the subwoofer. It is as a home cinema solution that Fidelio E6 excels, yet as a modern speaker system there's more to it than first meets the eye. With built-in Bluetooth and NFC the roaming rear units can easily be paired to a mobile device for streaming, and if you're willing to lug both units around they can be utilised as a stereo pair - handy if you want to do the gardening in style. 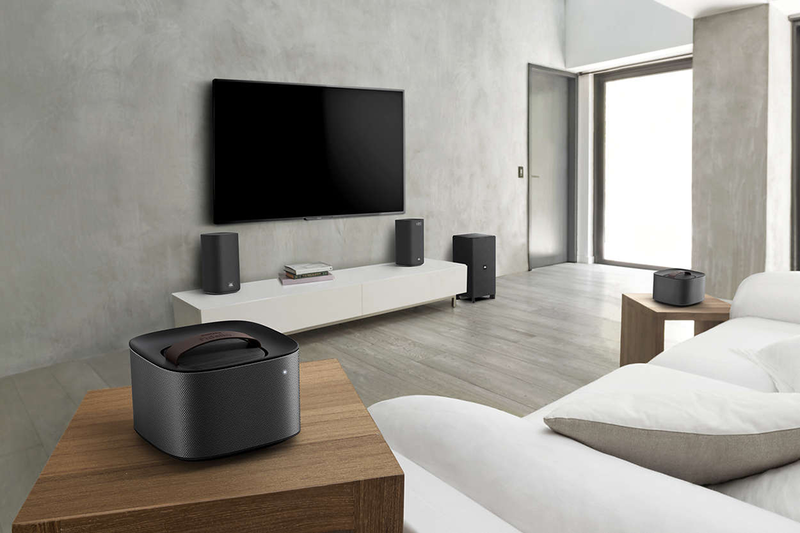 Back indoors, and with the system attached to a home WiFi network, you also have the ability to stream music via the likes of Google Cast and Spotify Connect. Handy options to have, but Philips' software doesn't quite live up to the standards set by the hardware. The companion app, available for Android and iOS, is awkwardly dubbed HCWeSet and lacks polish. 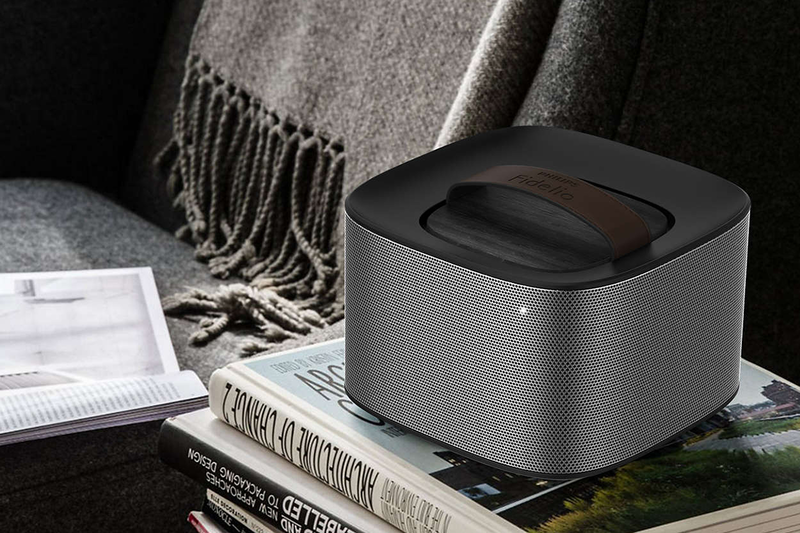 It's usable and does a good enough job of carrying out software updates, but there's no option to play content from a UPnP server so music fans should note that the Fidelio E6 doesn't offer the streaming refinement of, say, Sonos.